"What butter and whiskey will not cure, there is no cure for." As a man (and product) of science, I should fundamentally disagree with this on all levels. Managing my anxiety takes nigh grams of anti-anxiety drugs. You could have slathered the two onto my spine for all eternity but the only thing that would have cured that was a bone saw and a skilled doctor. But still...I love this phrase. And, for maladies that don't require a doctor's intervention, I find them a potent mixture of comfort and abatement of pain. But it's missing something. They should change that phrase and every Brit knows to the marrow of their bones that they should. A healthy cup of tea (with or without whiskey, cream, or sugar) is a failsafe cure-all in the British Isles and I agree heartily. When I'm sick with a cold, flu, headache, or whatever, I reach for two things: over the counter medicine and a whole lot of tea. Frankly, this is not a can (or bottle) of tea to pick up if you have a fever or are on any significant dosage of Nyquil. That granny is SCARY. Look at that. "They will never find your body, dearie..."
I mean, just...GAHHHHHHHH. Those eyes bore into my goddamn soul. 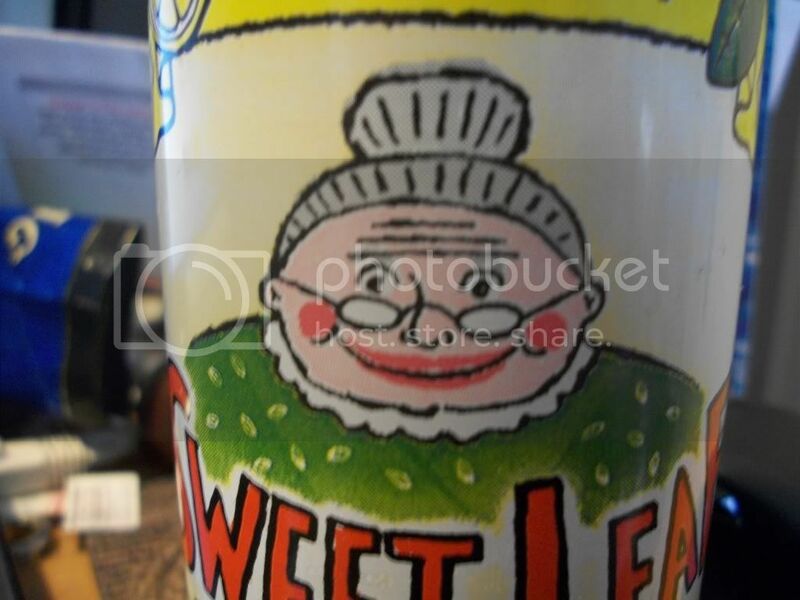 I'm finding a trend in canned tea of ludicrous can decorations that can just be downright chilling. C'mon labeling artists. Buck up and gimme a friendly granny holding a plate of cookies (complete with heat lines coming off the top) and a glass of tea. Not Franken-Nanny. The good news is the tea is pretty solid. They don't use HFCS or any other gross crap like that so it's a pretty easy drinker that doesn't leave your mouth like a oil slick. 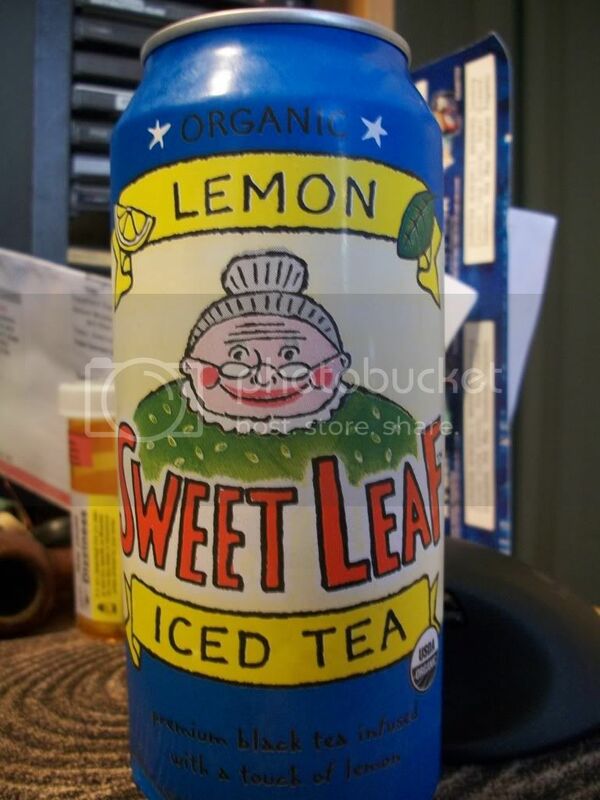 I'd be a bit happier if they toned down on the lemon and/or boosted the tea flavor but that's just me. I remember when I was younger I didn't like it because it wasn't sweet enough. I am downright Southern when it comes to my iced tea. I prefer an hellion brew of super strong tea cradled and swaddled in liquid diabeetus. But maybe it's my stuffy nose talking though. Anyway, creeper granny aside, I'm feeling better already. If I put some whiskey into it and make it a buttered, fortified iced tea, I should be good in no time. You were expecting this to be a post about my recent employment at Tuthilltown and what I do in the Willy Wonka shop. Well, I have to clear the article through HR before it can get posted. And before that, well, I have to write it. I was going to do that this weekend but the majority of the shocking little time I had was spent trying to find a car. I'll write it sometime this week. Maybe. Instead, I bring equally good tidings. You will find, on page 20 of Issue 99 of Whisky Magazine (coming soon, if not already, to your local Barnes and Noble) a wee little article on craft distilling. It's titled "The Art of Craft." It's about 1500 words. Actually, it is 1478 pre-editing. How do I know these things? "Distillation today is a far cry from its introduction. When distillation first started, it was done as a necessity rather than a luxury. Completed in small batches on farms to save crops that would otherwise spoil, distillation was by no means an industrial process. Times have changed and distillation has become a multi-billion dollar business. Long gone are the days of private distillers handcrafting product in nigh miniscule volumes. Or are they? In the past 10 years, while companies like Diageo have been growing larger, a trend in the United States has been pushing to smaller. Smaller volumes, smaller companies, and smaller stills, this trend has steadily grown to the point that it is gaining international attention. Known by many names such as craft, boutique, or farm distilling, smallscale and independent distillers free from the multinational conglomerate yoke have been cropping up across the country. It is difficult to put a definition on exactly what a micro-distiller is and what they distill as well. The easiest way to describe them is ‘hands-on.' Many of the distillers do not have the budget to hire engineers, publicity teams, and lawyers. Since it is so expensive to start a microdistillery, in terms of both licensing fees and equipment prices, they have to do everything independently and at minimal costs. But this independence gives them the freedom to produce whatever they desire." 1. Make a cup of coffee. Add cream and sugar as necessary. 2. Drink coffee. Peruse newspaper. Relax. 3. Grab keys. And cash. Or credit. Maybe even a gift certificate. But no checks. Paying for a $6.99 magazine with a check is tacky. 4. Don't forget your Barnes and Noble discount card. 5. Get in car. Make sure that it has gas. 6. Get gas because you are almost out. Pick up a soda or something. I recommend Mountain Dew. 7. Go to Barnes and Noble. Head to the Food and Wine section. 8a. Pick up copy of Whisky Magazine. Cradle it like a newborn. 8b. They don't have the latest copy. Find the manager and yell at them until the police arrive. Post bail, go home, and start from 1 (hopefully skipping 8b this time). 9. Go to the cash register and purchase said magazine. 10. Put it in the trunk of your car. Don't want the cops to find it if you get pulled over for speeding. 11b. Get stopped by cops because you're a lead-foot. Yell at cop that you have critical mission documents in your trunk and that no one can stop you. Don't resist the taser; just go with it. Post bail and start from step 1 (definitely skipping step 11b this time). 12. Read it. Bask in my linguistic prowess. Or you could just subscribe. That would save you a lot of time. And maybe some bail money.